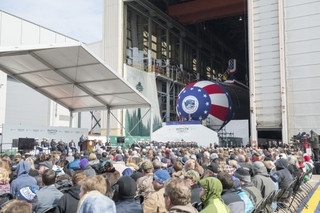 NEWPORT NEWS, Va. (March 5, 2016) -- Huntington Ingalls Industries’ (NYSE:HII) Newport News Shipbuilding division today celebrated the christening of the future USS Washington (SSN 787), the 14th Virginia-class submarine. 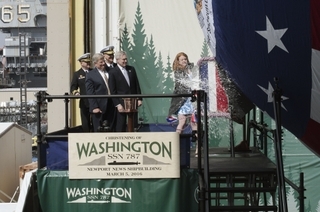 Ship sponsor Elisabeth Mabus, daughter of Secretary of the Navy Ray Mabus, smashed a bottle of sparkling wine, dipped in the waters of Washington’s Puget Sound, across the bow to mark the christening of the submarine named for the Evergreen State. Secretary Mabus served as the ceremony’s keynote speaker. Other ceremony participants included Rep. Randy Forbes, R-Va.; Rep. Bobby Scott, D-Va.; Adm. James Caldwell, director, Naval Nuclear Propulsion Program; Vice Adm. Joseph Tofalo, commander of Submarine Forces, Submarine Forces Atlantic and Allied Submarine Command; Matt Mulherin, president, Newport News Shipbuilding; and Jeffrey Geiger, president, General Dynamics Electric Boat. 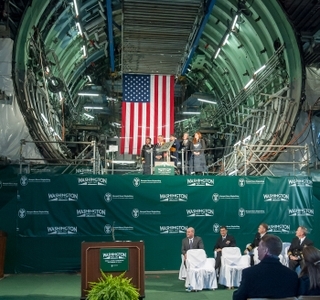 Secretary Mabus highlighted the award of 10 Virginia-class submarines in the Block IV contract, the largest shipbuilding contract in U.S. Navy history, and the cost savings associated with it. Washington will be the seventh Virginia-class submarine delivered by Newport News. 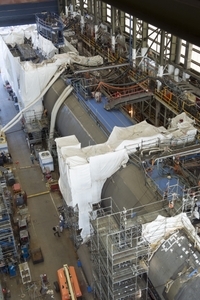 Construction began in September 2011, marking the beginning of the two-submarines-per-year build plan between Newport News and General Dynamics Electric Boat. Nearly 4,000 Newport News shipbuilders have worked on Washington. The submarine is on track to be delivered in 2016.